Step 1. 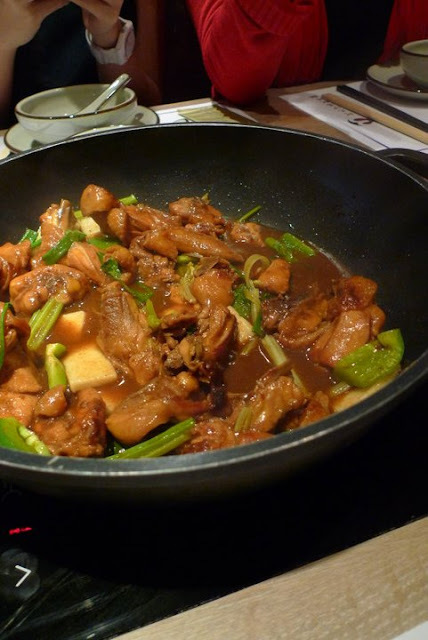 Order the original huadiao chicken with a side of guotiao (wide noodles). Step 2. The server presents the chicken casserole and puts it on the (electric) stove in front of you. Apart from chicken, there's Chinese celery and parsley, as well as Shanghai niangao slices (glutinous rice cake/dumpling-like things). Step 3. The server lifts the cover after about 30 secs and begins tossing the contents of the pot around with a ladle, mostly so that the celery and parsley start to wilt and start to release their distinctive fragrances. You begin to smell a savoury sweetness and a hint of earthy, floral alcohol. Step 4. Inhale that wonderful huadiao-tinged sweet soy air. Eat. The. Chicken. (But leave the niangao in for a couple of mins longer to soften). 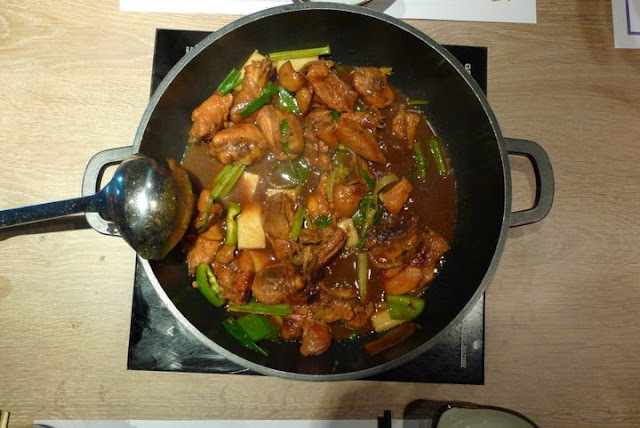 The huadiao has soaked beautifully into the chicken. Enough to satisfy the chant of "More! More! More! "banging on in your head, but not so much that it overwhelms the soy, (rock?) sugar, celery and parsley polka that's going on on your tongue. Step 5. The server comes back, transfers any remaining chicken out of the pot into a bowl, and tips the noodles in. Step 6. He tosses the noodles around with his ladle. You wait in agony as the huadiao and soy steam wafts in the air. Step 7. More huadiao and soy is poured in. More tossing. The noodles become coated in a glossy brown. Step 8. Finally, the server scoops up the noodles into separate bowls. Step 9. Eat. The. Noodles. Feel the bounce, feel elasticity you've never felt in a noodle before. Go to noodle nirvana. Step 10. 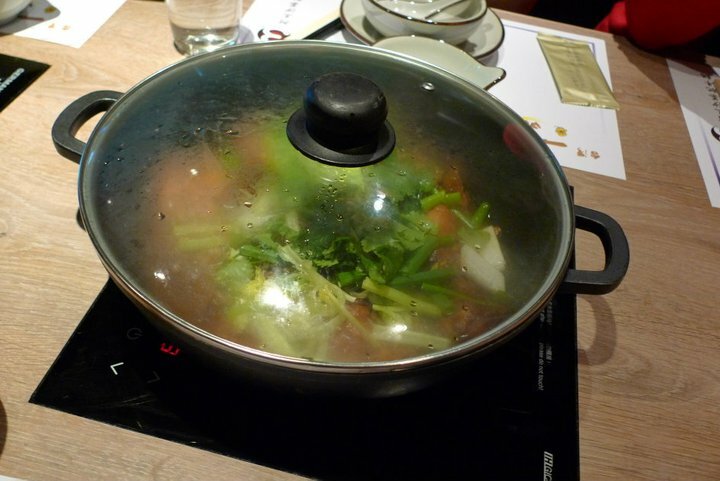 If you decide you can't let the good stuff sticking to the bottom of the pot go, ask to continue with 'normal' hot pot in the same pot, and the server will deglaze the pot with stock. Deliciousness. wow! that indeed is a special something something! must be delicious! haha yeah, now I'll remember the "something something" in that longass name coz it was yum! !